More like a soft and crunchy bread casserole than an eggy pudding, this sweet and savory dessert, known as capirotada (kah-pee-roh-tah-dah) in Mexico, is bound to appeal to those who don’t usually like custards. It doesn’t contain any eggs or milk. Preheat the oven to 350 degrees F. Butter a glass casserole or lasagna pan. Melt the butter in a medium saucepan, add the bread cubes, and stir them to coat evenly. Spread the cubes on a baking sheet and bake for 15 minutes, stirring once, or until lightly brown and crisp. Remove the bread and turn up the oven temperature to 400 degrees F.
Combine the sugar and water in a small saucepan and bring to a boil. Remove the syrup from the heat. Stir in the cinnamon and the raisins and set aside. In a large mixing bowl, combine the chopped apples, walnuts, cheese, and toasted bread cubes. Drizzle with the reserved sugar syrup and mix ingredients to evenly distribute the syrup. Transfer the mixture to the prepared pan. Bake, uncovered, stirring occasionally, for 15 minutes. Then bake an additional 5 minutes, without stirring, until the top is golden brown and crusty and the liquid is absorbed. 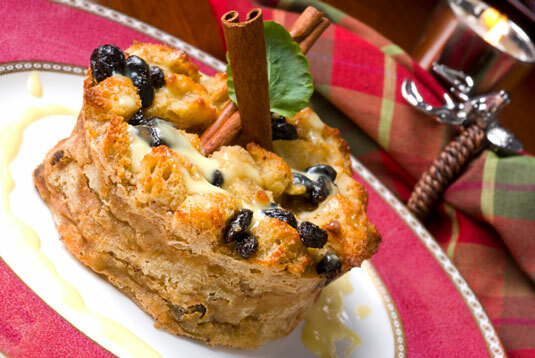 Serve the bread pudding warm in bowls, with pitchers of Crema or heavy cream for adding at the table. A drizzle of Crema adds that sour tang you crave with your sweets. Whisk the cream and buttermilk together in a bowl. Cover and set the bowl in a warm place (a gas oven with just the heat from the pilot light is fine) for 8 hours until thick as custard. Store in the refrigerator for as long as a week.